Carlos Baker unrolls a carpet from the interior of his black Mercedes-Benz 2500 Sprinter out to the curb. Inside, extra head space, seven leather seats, dual computer monitors and a Keurig coffee maker hint that this isn’t a carpool van. 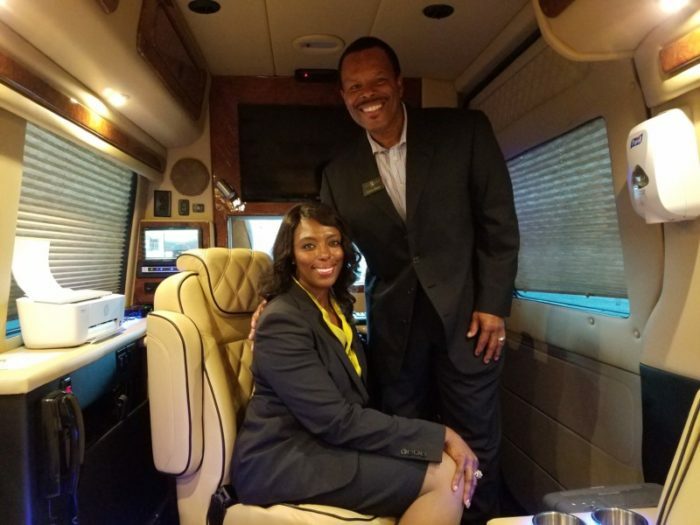 In fact, Baker, 58, spent over a quarter of a million dollars outfitting the shell of the van with state-of-the art upgrades; an iPad, Microsoft Surface Pro, conference phone and 360 degree cameras are just a few of the amenities inside Baker’s mobile, luxury conference suite, a business he and wife, Shenita, launched in March. The Bakers named their company Steps Ahead, a reference to their next-level high standards. Carlos and Shenita met at the University of Louisiana at Monroe, then known as Northeast Louisiana University. The couple eventually married, moving to Franklin in 1991. Carlos has a background in manufacturing engineering and human resources, and with the military. Last year, he retired from General Motors after over 30 years. Shenita is a vice president with Fidelity National Title Group in Franklin, but she also manages the marketing, as Carlos’ business partner. Baker had been working on a plan for the business since before he retired. He came up with the concept through his work travels. “One of the biggest complaints he had was, it’s very difficult to be connected and get work done while you’re traveling,” Shenita said. Since Baker worked on projects pertaining to products that hadn’t yet launched, he worried about keeping his work confidential. They researched other mobile offices, but couldn’t find a business that provided a high standard of amenity and security. “We wanted it to feel like it’s a private jet,” Shenita said. They market their business through the Williamson, Inc. Chamber of Commerce and the Nashville Convention and Visitor’s Bureau. Currently, a lot of their clientele come from word of mouth. For visitors involved in economic development, Steps Ahead provides a practical service. “They have a way to see the city, conduct business and to be able to ensure that they have a really good experience,” Shenita said. Some of their clients are commercial realtors, who want to show high-end clients properties, music producers, athletes, and other executive types who simply need a private place to work while traveling. Security is a key point in their business model: Drivers go through training, are certified as notary publics and go through an FBI background check. The computers are wiped of information after every client’s use. Like a concierge at a five-star hotel, drivers dress to impress in a company-provided tapered suit, monogrammed tie, Mercedes-Benz gold cufflinks and white gloves. 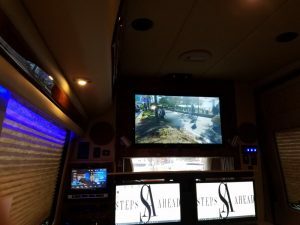 Shenita said Steps Ahead has a vetting process to make sure those looking to utilize their services are corporate clients, not simply looking for a fun night out on the town. “We’ve had to turn some clients away,” she said. “Yes, it’s business that you may be losing, but we want to maintain the integrity of what this business model is.” While they won’t tolerate rowdiness from clients, the Bakers are more than willing to accommodate special requests; after a client asked for Jack Daniel’s coffee, the van is now stocked with it. One client came into town with her four assistants in tow. While they monitored work situations on their laptops inside the mobile office, Carlos drove the woman to the Green Hills Mall for an extensive shoe shopping excursion. When she came back, her assistants said, “This was an amazing experience! We had snacks, we had drinks, we had it all.” Carlos related.